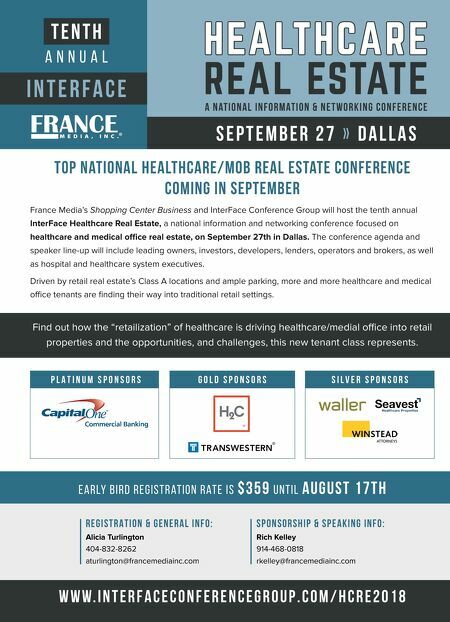 France Media's Shopping Center Business and InterFace Conference Group will host the tenth annual InterFace Healthcare Real Estate, a national information and networking conference focused on healthcare and medical office real estate, on September 27th in Dallas. The conference agenda and speaker line-up will include leading owners, investors, developers, lenders, operators and brokers, as well as hospital and healthcare system executives. 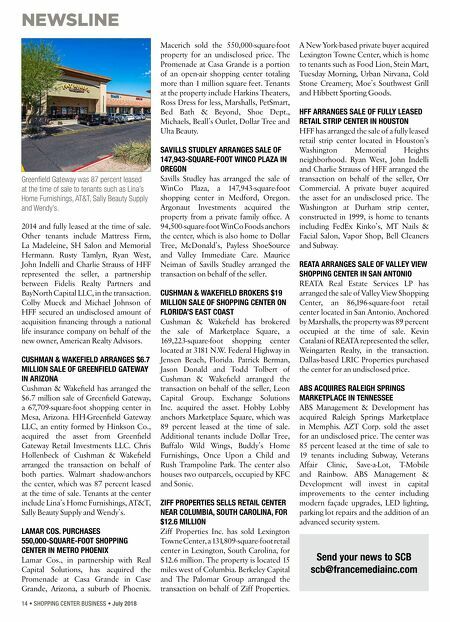 Driven by retail real estate's Class A locations and ample parking, more and more healthcare and medical office tenants are finding their way into traditional retail settings. T E N T H A n n u a l HEALTHCARE REAL ESTATE I N T E R F A C E A N at i o n a l I n f o r m at i o n & N e t w o r k i n g C o n f e r e n c e S e p t e m b e r 2 7 » D a l l a s w w w . i n t e r f a c e c o n f e r e n c e g r o u p . c o m / h c r e 2 0 1 8 T o p N at i o n a l H e a lt h c a r e / M O B R e a l E s tat e C o n f e r e n c e C o m i n g i n S e p t e m b e r Alicia Turlington 404-832-8262 aturlington@francemediainc.com R E G I S T R A T I O N & G E N E R A L I N F O : S P O N S O R S H I P & S P E A K I N G I N F O : Rich Kelley 914-468-0818 rkelley@francemediainc.com E a r ly B i r d R e g i s t r at i o n R at e i s $ 3 5 9 U N T I L A u g u s t 1 7 t h G O L D S P O N S O R S S I L V E R S P O N S O R S P L A T I N U M S P O N S O R S Find out how the "retailization" of healthcare is driving healthcare/medial office into retail properties and the opportunities, and challenges, this new tenant class represents.